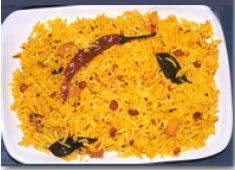 Puliyodharai means Tamarind rice. Tamaraind is used widely by the people of tamilnadu. This recipe is one such in which tamarind rules the flavour. Its spicy and nutritious too and is liked by rural people by tamilnadu. Its economic and hence adds adavantage to the poor people from the state . Wash and boil the rice in lots of water till 3/4th done. Then Drain , mix in 4tbsp of oil and let it cool. Soak the tamarind in warm water and extract the pulp and keep aside. Heat 2 tbsp of oil and fry the masala ingredients. Cool and grind into a coarse powder. Soak the peanuts for 5 mins and drain. Dry roast the sesame seeds(thill seeds) on a tava on medium heat, cool and pound to a coarse powder. Heat the remaining oil in a vessel. Temper oil with mustard seeds, red chillies and curry leaves. Add the peanuts and fry for a while. Add the tamarind pulp and cook for few minutes. Add the masala powder and turmeric powder and bring this to boil and continue simmering till the raw smell goes. Add salt and rice flour dissolved in little water. Mix well. Stir frequently till the oil floats on top and the mixture reduces to a fairly thick consistency. Add the cooled rice and toss to mix well. Sprinkle the sesame powder(thill powder) and mix well. Making time: 35- 40 minutes. Shelflife: 1 day (best fresh). Note: This tamaraind mixture can be made in large quantity and stored in refrigerator. Mix with hot rice whenever required. Use extra oil for longer shelf life.